Subscribe to my blog (click on the “follow” button at the right or bottom right of the page or top left of the toolbar) and post a comment to this article. A lucky winner will receive a $10 Wal-Mart gift card. Winner will be chosen at random on 9/14/12. Where did we learn that to give up our own needs to satisfy the needs of others was a worthy and humbling experience? Who taught us that in order to be a good person it was necessary to put more importance on the needs of others than our own? This is especially true for any type of abuse victim, be it physical, sexual, or psychological. Add guilt, religion, and other cultural factors and you have the makings of a fully-fledged martyr. More often women usually give too much of themselves than men, and those in service professions are the most guilty of neglecting their physical and emotional health. Nurses, teachers, social workers, and any type of caregiver easily fall into this category. They also have higher levels of stress and strained relationships at home. Somewhere along the road, be it starting in childhood or later in life, we were taught that our needs weren’t important and that had an underlying message of “You’re not worth it.” Boundaries were too often neglected. Anyone could walk all over us without proper limits set in place. You can’t possibly value others without valuing yourself. That’s the same as saying you can’t love others without loving yourself. Both are true statements. Most of the time when an abuse survivor operates from past behavior patterns, you are doing good deeds for others not because you’re coming from a place of love, but from a place of need for approval, attention, acceptance, or love. Everything you did in the past was to satisfy others and now that you’re trying to satisfy yourself, those feelings of not being worthy can easily rise to the surface. It gets harder to take care of yourself because of the guilt. Guilt is like a gigantic self imposed roadblock–a roadblock of your own creation based on the foundation of wrong thinking, on your own misperceptions or those influenced by other people’s versions of the truth that are not your own. The good news is that because this roadblock was built upon a shaky foundation it will be easier to remove. Watch it fall apart right in front of you as you learn to accept the truth that you are worthy and that you deserve to be treated fairly. Being a martyr is not being humble –that’s allowing yourself to be persecuted for sins that aren’t your own. The person who influenced you by encouraging you to disregard your own happiness and desires was living through you and making you responsible for their redemption. Take a look at Mother Teresa. She had to be one of the most humble women on the planet, giving selflessly to serve dying homeless, penniless people in Calcutta. But if you crossed her, told her she couldn’t open a shelter somewhere, or told her that she was going to catch some kind of illness helping the destitute, she could blast you from here to the moon. She didn’t put up with “you can’t” or “I can’t.” She didn’t allow herself to be bullied by anyone. Mother Teresa may be in the running for sainthood by the Catholic church, but when it came to her temper she could cut loose –all in the name of humanity. For those who had no voice she lent hers. 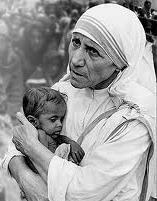 Yes, Mother Teresa was humble but she was no martyr. Yes, she saw to the needs of others, but she recognized that if she didn’t command respect, she’d be on her knees begging for help just like the people she was trying to save. She expected people to support her cause. She didn’t go around with empty palms and sad puppy eyes. She didn’t hold her hand out for a check –money was freely given to her. She made people feel responsible for caring for others through her proactive work. Mother Teresa had no problem putting her needs in front of others when she had to — when it meant to find food, clothing, and shelter for those she wanted to help. She’d get the money to make it her dream of helping others a reality but she didn’t sacrifice her soul or dignity to get it. She wasn’t a martyr and didn’t lie in the street like a victim. Putting your emotional, physical, and psychological needs first doesn’t mean you’re being selfish. It means that you recognize you have to take care of yourself if you want to be of greater service to others or the community. Don’t allow yourself to be a victim or a martyr. Stand strong in your “I am Love” power and be proactive so that you can transfer that energy to your life and those who need your help. Use that energy to create a new road map for yourself, with a direction pointed directly at emotional and mental health, strong boundaries, and Love enough to provide a vision for others to follow. Pull out your creative energy guns and blast the world with your own personal colors that will paint a picture of truth, happiness, and inspiration. Do you forget to take care of yourself? Do you let guilt deprive you from living your life to the fullest?